You might be surprised to find out that Google, the mother of all search engines, has a program specifically created for nonprofit organizations. 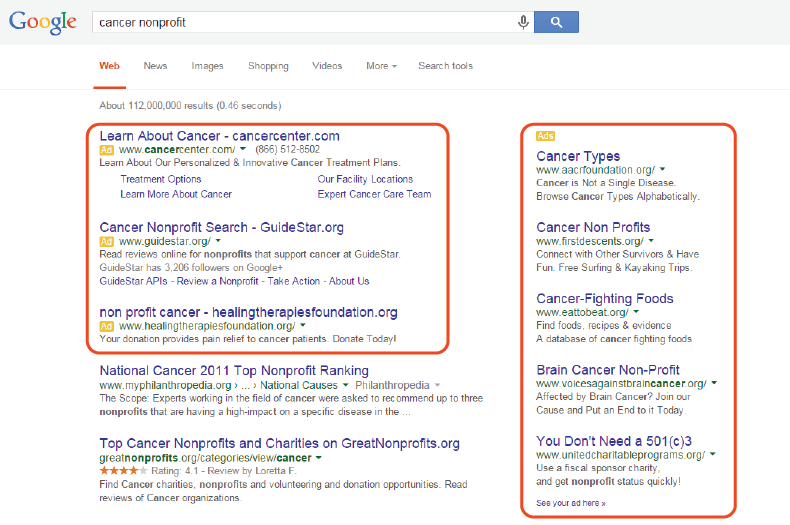 Google for Nonprofits includes a free membership and access to Google Grants, which provides nonprofits with $10,000 per month to advertise on Google.com. As a nonprofit, this is one opportunity you don’t want to ignore. Google Grants has the potential to drive up to 40,000 new visitors to your nonprofit’s website each month. Organizations like Unicef and BeatBullying are using Google Grants to fund their ad campaigns, and you should be too. The first thing you need to know is that Google Grants requires you to use Google’s Adwords platform. Adwords allow you to create ads based on selected keywords that are specific to your nonprofit. The ads appear at the top and on the side of a search results page. You can learn more about Adwords here. Google Adwords ads appear at the top and on the side of a results page. Take some time to brainstorm the different keywords or key phrases that users might be using to find your nonprofit. You can research the popularity of your selected keywords with Google’s keyword research tool. First, you’ll want to make sure that you’ve written effective and engaging copy. But, don’t assume that everyone in your audience is going to respond. Test 3 or 4 different versions of an ad to determine which one performs the best. If you’re hoping for conversions, it’s best to make it as easy as possible for your visitors. Your ad should take users to a page with pertinent information and a noticeable call-to-action, like a sign-up form or a donation button. Make sure the information on your landing page is relevant to the headline in your ad. If you want your visitors to sign up for a newsletter or blog, asking for an email address is all it takes. Try to avoid adding unnecessary fields in your form. Google Grants is only available to Google for Nonprofit members. You can sign up for free here. Check out the other organizations using Google Grants in the Google for Nonprofits community.